Boston Dynamics' humanoid robot Atlas is a multi-talented, multi-tasker. His latest feat is to bound up multi layers of platform, shifting his weight from right foot to left and back to the right foot as it runs upstairs. In other words, it can do parkour training, using exercise movements developed from military course training. Atlas can backflip, run through the snow without falling, bound up stairs. 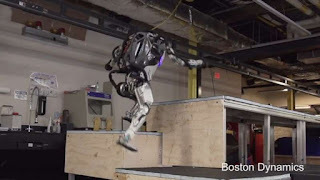 It's athletic prowess is being constantly upgraded to manage its way in the world and assist humans as a humanoid robot walking, running and jumping among us. Robotic technology is advancing leaps and bounds. Robots are clearly a growing part of our future, whether on 2 legs like Atlas, 4 legs like Boston Dynamics' Spot Mini or flying through the air like DARPA's flying robotic insects.